Peel and finely chop the onions and garlic. Transfer to a pot with half the butter and sauté for approx. 10 min. Add white wine and cook for approx. 5 min. more. Once onions are translucent and very soft, add sour cream, and season with salt and sugar. Transfer to a food processor and purée until smooth. Keep warm and set aside. Bring a pot of water to a boil and salt generously. Trim ends of green beans and cook in boiling water for approx. 5 min. Transfer to a large bowl filled with ice or cold water to stop the cooking process and preserve the bright green color. Dice the smoked bacon and chop the summer savory. Preheat the oven to 140°C/285°F. Preheat a grill pan over medium-high heat. Rub the racks of lamb with oil and season with salt and pepper. Sear both sides in the grill pan, approx. 5 min. on each side. Then transfer the lamb to the oven and roast the racks directly on an oven rack for approx. 10 min. or until cooked to your desired level of doneness. Remove from the oven and let rest. In a frying pan set over medium-high heat, melt remaining butter. Add smoked bacon and green beans. Season with salt and pepper then add the savory. Sauté for approx. 3 min. 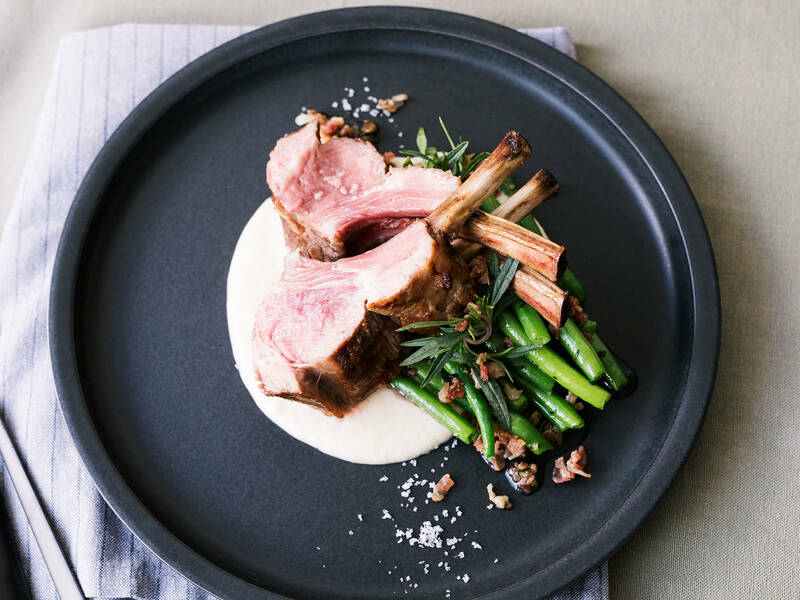 Slice rack of lamb and serve with onion purée and green beans. Enjoy!